The 18-song set covers basic concepts and themes such as Greetings (Hello and Goodbye), Numbers, Colors, Body Parts, Animals, Actions, Family, Daily Activities and Phonics. It also includes a great Clean Up song with a bouncy Caribbean rhythm that gets kids moving FAST! 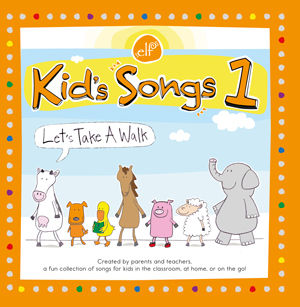 Kids Songs 1 (Let's Talk A Walk) by ELF Learning is the perfect addition to any young learner's classroom or home. Running time 40 minutes.